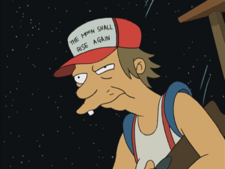 The words on his hat (1ACV02) are a reference to the Confederate States of America. The hydroponic farmer is a farmer who works on a hydroponic farm on the Moon. The hydroponic farmer tried to kill Bender because he seduced the Crushinator, whom he does not allow anyone to touch, on the Moon in 3000 (1ACV02); drove a hoverlorry full of chickens through Historic √66 in 3001 (3ACV02); was non-canonically destroyed by the Planet Express ship on the Moon in 3008 (TBwaBB); attended the Space Demolition Derby in 3008 (BG); attended the violet dwarf star implosion ceremony in 3009 (ItWGY); protested against the teaching of evolution outside the Wozniak Nerd Academy in 3010 (6ACV09); invited Clamps, Hermes, Amy, Leela, Fry, Zoidberg and Farnsworth for supper on the hydroponic farm in 3011 (6ACV14) and sold vegetables from his Moon's Finest Produce stand at the Local Group Farmers Market in 3011 (6ACV22). The farmer was drawn in Fleischer style in The Beast with a Billion Backs and without eyes in Into the Wild Green Yonder. The farmer was the only non-primary character to appear in both the ninth episode of the seventh broadcast season (otherwise known as season 6A) and the ninth episode of the eighth broadcast season (otherwise known as season 6B). Hydroponic farmer: Looky here, city girl. Oxygen don't grow on trees. Hydroponic farmer: Drops down to -173! Hydroponic farmer: First one, then th'other. Hydroponic farmer: I'll learn ye to sleep with my robot daughters! Hydroponic farmer: That is an insultingly accurate stereotype, sir! Hydroponic farmer: Nope, don't recollect nobody by that name. This page was last edited on 3 August 2014, at 20:33.